If you are looking for an all-inclusive unit, look no further than this Sunset Trail Super Lite travel trailer! 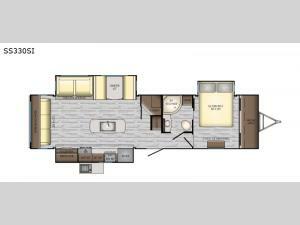 From the three slides to the master suite, this unit delivers comfortable elegance all throughout. As you chop veggies or wash dishes, you will appreciate the kitchen island for the extra countertop space that it provides, and the large pantry will help you store all of your favorite spices and snacks. You will look forward to the evening time when you can lounge on the 82" sofa or theater seating as you warm up next to the fireplace.